Are you commuting in a Tesla during the polar vortex? Be prepared. A new study by the American Automobile Association (AAA) found that cold temperatures can temporarily reduce the range of electric car batteries by 41 percent. To compare how the batteries performed in extreme temperatures, both hot and cold, the organization evaluated five vehicles: the 2018 BMW i3s, Chevrolet Bolts and Nissan Leafs and the 2017 Tesla Model S 75Ds and Volkswagen e-Golfs. In 20-degree weather, the average driving range dropped by 12 percent -- but only when the car’s heater was not used, an unlikely scenario for people driving home in freezing temperatures. When interior heaters were used, the range dropped by an average of 41 percent. Hotter weather, by contrast, did not appear to have as dramatic of an effect. Researchers said that the battery range dropped by 17 percent with the interior air conditioners running in 95 degrees. AAA researchers say that people who live in cold areas shouldn’t be deterred from buying an electric vehicle. They just have to be prepared. 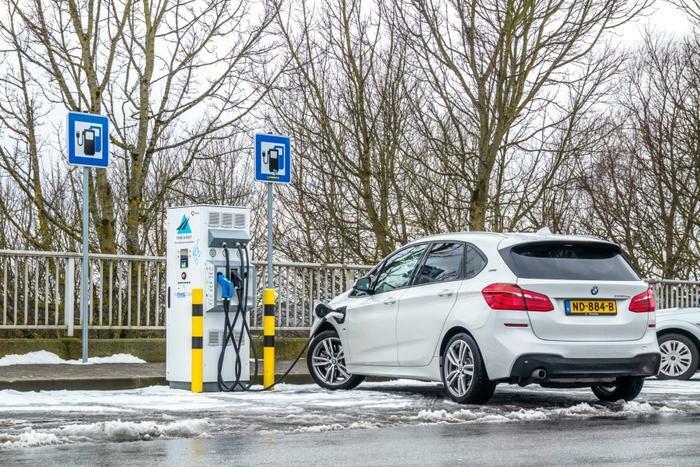 “As long as drivers understand that there are limitations when operating electric vehicles in more extreme climates, they are less likely to be caught off guard by an unexpected drop in driving range," AAA Automotive Engineering Director Greg Brannon said in a statement. The findings may have taken some drivers by surprise. Elon Musk has previously downplayed concerns that cold weather reduces battery power. Musk responded that Tesla batteries only lose 10 percent of their range in cold weather, no different than what would happen in a traffic jam.